The first part of my exclamation was definitely not fit for a family newspaper. Picture this: it’s a perfectly lovely summer day. You know, one of those we imagine through our long winter: sunshine, good breeze and temperatures just where you like them. Many opt for the seventies while I do prefer mid-eighties. In fact, postponing this beyond what you’ve just read, I elect to enjoy my late afternoon attacking a small bed of weeds. Great idea — only the attack turned out not to be one-sided. Those tiny black dots (I’ve photographed them on my legs for they seemed harmless) decided this was the time to pick on me. In me, perhaps, for they tried to get my nose (I was determined to keep my mouth closed) and simply swarmed. Bug deterrent is now on my list for tomorrow’s outing. But that’s another topic. I was corrected. We may well have horseflies but what I’m reacting to are truly deer flies. That bug that stings and looks like a triangle. They bloodied Minor’s nose when I pulled one off him. They bite — boy! and how! — but on me leave none of the welts I read about. One bite in the spring and I seem have an immunity that prevents pain or, in the case of mosquitoes, even itching for the whole summer. That does not mean I like them any better. 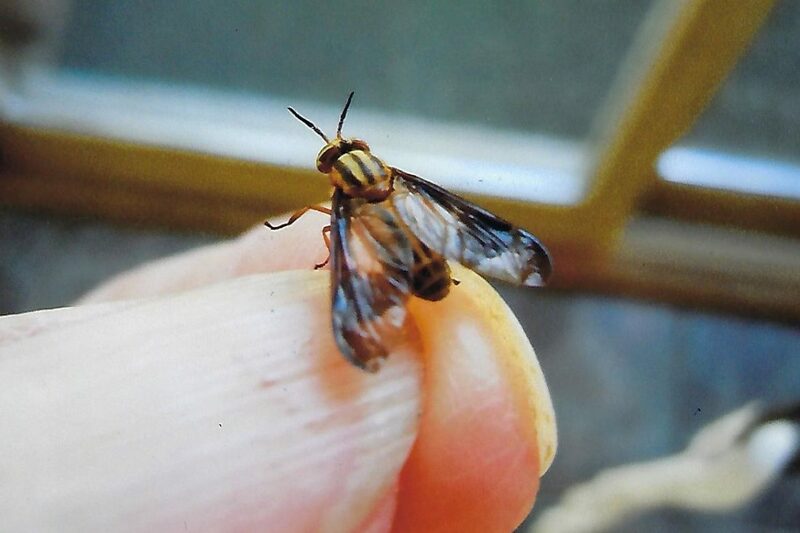 A deer fly is 3/8-5/8” with a somewhat flattened body and a smaller head than the horse fly. The latter is 3/4-1 1/8″ and lacks the bright green or gold eyes of the deer fly. Now that I’m back inside and they aren’t, I have to admit the deer fly is a most interesting insect. Let’s start with the male. He’s a flower lover with no interest in biting anything and only wants to feast on sweet nectar and pollen. You may notice a female flying in circles around your head. She’s rating you as a potential host and, if you pass that test, looking for a suitable place to land. But then . . . For starters, the female deer fly doesn’t really bite. She makes a cross-shaped incision with two sets of slicing teeth that enable her to saw through the skin of a host and sever an underlying blood vessel or two. She then coats the tiny gash in the skin with saliva containing anti-coagulant substances that help prevent the blood from clotting as it encounters the air. This allows the blood to begin to flow which she eagerly sops up, lapping several drops of blood before retreating to safety. She needs that warm blood for the development of her eggs. Don’t be surprised if you find a few drops after she’s gone. Should you catch one in the act, I’m willing to bet you’ll smack it before taking the time to think. Often such a fly will fall lifelessly to the ground after being struck. Don’t let her fool you. Within seconds she’s upright and off to attempt another attack. One suggestion to escape was to travel (quickly!) to Hawaii, Greenland, or Iceland, the only three places they don’t live. More realistically perhaps, is hiding indoors the only solution? It’s definitely the best but, it’s summertime (which never lasts long enough) so let’s forget that though it’s noted horse flies and deer flies like sunny areas and won’t enter deep shade. The low to mid-70’s is believed to be the minimum temperature range needed to permit a sustained period of flight. Also, because of the intensity of sunlight around the solstice, a deer fly has evolved a set of eyes capable of functioning in bright light. On overcast days, a deer fly loses its ability to quickly spot a potential host which reduces its nuisance value (to put it mildly). Some repellents may offer some protection but the factors that attracted them in the first place are still present (movement, carbon dioxide, warmth and shiny surfaces) and they will continue to swarm. They also seem to have a particular preference for swimming spots be it the shiny surface or the swimmer’s movement. Deer flies only hunt during the day with peak activity the three hours after sunrise and the two before sunset. Like many of us, they don’t like temperatures in the nineties. And, yes, there is good news: “deer fly season is typically contained to 4-5 weeks in late June and July. Deer flies clear out by August . . .